Happiness is a long walk with a putter. Photo Eoin Clarke/www.golffile.iePadraig Harrington declared “Harri Putter” back in business after a 71 gave him just his third sub-par start in 13 Masters appearances. The Dubliner, 40, has crashed to 96th in the world over the last three years and found life even tougher in recent months as he battles a crisis of confidence with his putter. But he was delighted to see his magic wand produce the goods again as he took just 27 putts and fired an eagle and two birdies to finisht the day just four shots off the lead held by England’s Lee Westwood. While refusing to elaborate on a return to the “cut” putting style, he said: “I made a few changes and I was very happy with what I saw out there on the greens today. I don’t want to talk about the technical changes I’ve made - I’m back to holing putts, that’s all I know. “Whether it continues like this for the next couple of days, I don’t know, but it certainly is the right road to be going down over the next number of weeks so I’m very positive about that side. “My putting is definitely what pleased me most about the day. I missed a couple of putts and it didn’t bother me. I liked what I saw and a 71 is always a decent start in a major. 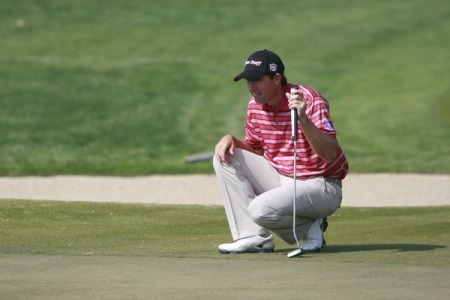 Seeking his first major since 2008, Harrington kicked off a series of vital par saves with a four footer at the first. But the real key to his round was a sensational eagle three at the second - his first in 41 attempts on a hole where he made a quadruple bogey nine in 2009. That gave him room for manoeuvre on the tough front nine as well as his second set of crystal goblets this week following his Par-Three win. Looking anxious after hooking his drive around the corner, he finished up well down on the flat and hit a 229-yard five iron with a draw to eight feet behind the stick and drained to the putt to take the early lead. He never looked back after that and got up and down for par after barely overshooting at the third before holing a crucial four footer for a bogey at the par-three fourth after bunkering his rescue wood tee shot in the right hand trap and then powering his par putt from the middle tier well past the hole. He looked likely to salvage a great par at the seventh when he hit a sensational draw out of the left trees to the back fringe. But while he came up three feet short with his slick putt and then stood off his par putt before missing it well left, he birdied the par-five eighth despite a heavy handed pitch that ran nine feet and then saved a great par at the ninth. Forced to hack out of the trees on the right, he was short-sided left of the green but played a towering lob that spun back to 10 feet and holed the putt with confidence. A mud ball cost him a shot at the 11th, where he bailed out right out of fear. But after saving par with a six footer at the 14th, he barely carried the lake at the par-five 15th with a five wood and two putted from 18 feet for birdie to get back into the red. Caddie Ronan Flood thought it was heading for the water, but both could laugh about it afterwards. “We actually thought it was going to the back of the green,” Harrington said of his play on a hole that has caused him no end of headaches since he made his Masters debut in 2000. “But the last 50 yards of it, the wind gusted up. I always thought it was over. He obviously had a little bit of a moment. A bunker recover to three feet at the 17th helped him save par and keep his momentum going and he was pleased to see that the field hadn’t taken massive advantage of the soft conditions. Harrington said: “I’m pleased. I think I’m more pleased with the score. There’s very few players burning it up, let’s say. “Conditions are very good out there for scoring in terms of there’s no wind, greens are soft. But I think they were aware of that and put in some tough pins today. Harrington hostage to his putting but insists - "I don’t have anything to prove"
Padraig Harrington needs some confidence on the greens. Photo Eoin Clarke/www.golffile.iePadraig Harrington insists he’s got nothing to prove and feels under zero pressure to win a green jacket. The Dubliner, 40, is reminding himself that he has won more majors in the last five years than any other player in the field - including Tiger Woods. But with his putting streaky and inconsistent, he’s decided to shrug off the pressure that he’s been heaping on his own shoulders since 2008 and take a new tack. Padraig Harrington is just five shots off the lead following a second round 73 at Augusta National. Photo Eoin Clarke/www.golffile.iePadraig Harrington will be drawing on the memories of the sensational 61 he shot in Tampa just three weeks ago when he bids to claw back a five-shot gap on leaders Fred Couples and Jason Dufner at Augusta National. 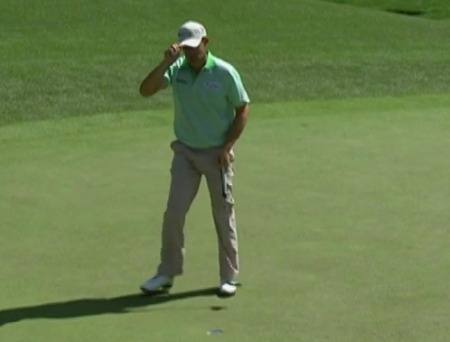 Padraig Harrington tips his cap to Masters patrons after his birdie at the sixth. 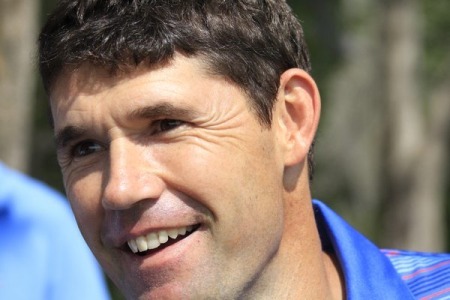 Unfortunatley for the Dubliner, he missed a hatful of chances on Sunday.Padraig Harrington was left to curse an ice cold putter as his slim hopes of winning a Masters green jacket on Sunday slipped away on the hallowed greens at Augusta National. Padraig Harrington plays his appraoch to the 15th in the final round of the Masters. Padraig Harrington is convinced he will go on to win even more majors after crossing a massive mental hurdle at the Masters. 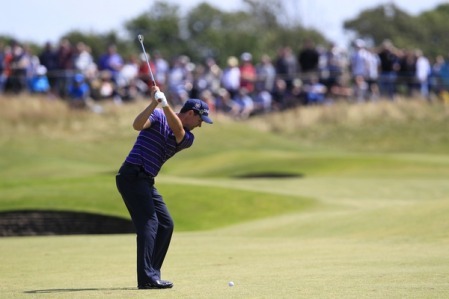 Padraig Harrington plays to the seventh in the final round of the 2012 Open. Photo Eoin Clarke/www.golffile.iePadraig Harrington wants golf chiefs to ban the long putter - or give him back his groove thing.